Santa_helper@protonmail.com Ransomware is a dangerous computer infection no one would want to deal with. However, if you happen to have this program on your PC, then you will have to do something about it. The only reason this infection arrives at your system is money, but you should never give into its demands. Remove Santa_helper@protonmail.com Ransomware with a professional security tool and then protect your computer from similar infections. You may not be able to restore the affected files, but you can always transfer healthy copies of your files back to your computer from a system backup. It is important to be always ready for the worst. Although ransomware programs can be distributed in various ways, it is very likely that Santa_helper@protonmail.com Ransomware entered your computer via spam email attachment. This is the most common ransomware distribution method. Cyber criminals employ spam campaigns to send out malicious emails to thousands of users around the world. These email messages usually look like invoices from online shops or important notices from financial institutions. Although normally email providers filter spam into the Junk mail section, messages that deliver ransomware apps manage to seep through into the main inbox. Users, who believe these mails have something important to tell them, eventually download the attachments and launch them. As a result, they get infected with malware. We believe it is important to educate users that it is not a good idea to download and open attachments without giving it a second thought. Did this message come from a sender you know? Does your financial institution send you attachments on a regular basis? Do your attachments usually come in the form of attachments or are they displayed in the body of the email? If you go through these questions before you open the attachment, there is a chance that you will be able to avoid the malicious infection. Security researchers suggest that Santa_helper@protonmail.com Ransomware should come from the same developers as the Ozozalocker Ransomware infection. However, although the programs look the same, they work differently. Our research lab points out that this new infection drops a .vbs file to the C:\Windows directory, and it does not use anything that would remind us of Ozozalocker. The name is not mentioned anywhere. So while both programs could come from the same source, it is easy to see they are two absolutely different entities. Therefore, they also require different removal methods. The program uses the AES-256 encryption algorithm to affect your files. It is very likely that the infection will encrypt most of your documents and files you use daily because ransomware apps usually target files in the %USERPROFILE% directory. On the other hand, the program will leave your system files healthy because it needs your computer to function for it to receive the ransom fee. Unfortunately, at the time of writing, there is no public decryption tool available, but it does not mean you have to hurry and pay the ransom. It is very likely that spending your money would not solve your problem, too. So what has to be done? First, you need to remove Santa_helper@protonmail.com Ransomware. We have manual removal instructions below, but if you think you cannot do that on your own, you can delete the infection with a security program. Since the ransomware program does not lock your screen, you do not need to load your computer in Safe Mode to bypass various hurdles. It is also necessary to get rid of the infection if you are going to transfer copies of your files back to your system. If you paste them into the same directory that contained the encrypted files, the chances are Santa_helper@protonmail.com Ransomware will encrypt them again. So if you have a file backup, you need to clean your computer before you copy and paste the healthy files back. Also, to protect your computer from similar infections, you should consider investing in a powerful antispyware tool. Not to mention that you should find out more about ransomware distribution methods because your actions online also matter. You may have the best antispyware program there is, but if you do not employ safe web browsing habits, malware infections would still find ways to enter your computer. Press Win+R and type %AppData% into the Open box. Click OK.
Find a random-name .exe file in the folder and delete it. Open SysWOW64 and delete the random-name .exe file. Go back and open System32 folder. Delete the same file. Press Win+R and type regedit. Click OK to open Registry Editor. 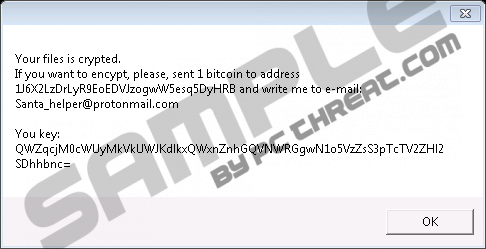 Quick & tested solution for Santa_helper@protonmail.com Ransomware removal.